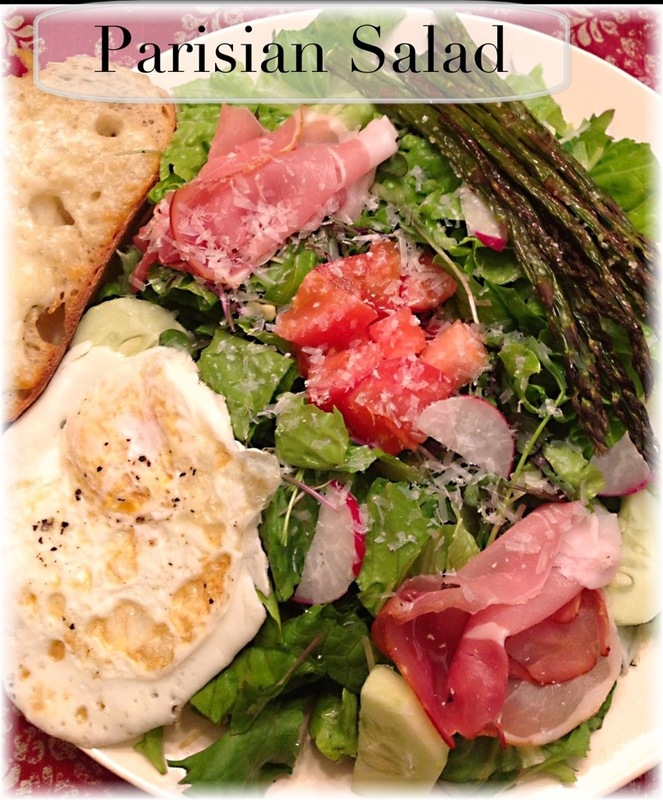 This recipe is based on a wonderful salad I had at a cafe in the Marais neighborhood in Paris. It is chock full of seasonal, local vegetables as well as tasty bits of prosciutto and a lightly fried egg. The egg and ham with the asparagus is really going to rock your taste buds! Delicious! And a complete meal. We are on day 5 of our Salad-a-Day challenge and having fun making up new salad recipes! Salad dressing of your choice. Preheat oven to 400 degrees. Line a rimmed baking sheet with parchment or foil. Trim asparagus and toss with olive oil. Spread on baking sheet and sprinkle with salt. Roast asparagus in oven for 15 minutes or until browned ( this will depend on how thick the stalks are). While asparagus is roasting, arrange greens on a salad plate or nice bowl. Make a well in the center and put tomatoes in the well. Arrange the remaining vegetables on the greens. Arrange two slices of prosciutto on each salad plate. When asparagus is done, remove pan from oven and add 1/2 of asparagus to each salad plate. In a saute pan, fry the 2 eggs, but leave the yolks a little soft. Add one egg to each salad plate. Serve immediately with your choice of vinaigrette dressing and a sprinkle of cheese.